Step 1 Place chicken, carrots, celery, mayonnaise, onion, tarragon, lemon juice, and pepper in a large bowl; gently stir to combine. Spoon mixture evenly into radicchio leaves. Serve immediately. This colorful protein- and veggie-packed meal is perfect for your next summer soirée or light-but-filling dinner. Not only are these delicious chicken salad cups low in carbohydrates and saturated fat, but they also incorporate tarragon, an herb we should all be familiar with. Tarragon has antibacterial properties, is rich in antioxidants, and aids digestion, says Health's contributing nutrition editor Cynthia Sass, MPH, RD. It pairs well with poultry, fish, and red meat, and you can even add tarragon leaves to iced summer cocktails and refreshments for a boost of unexpected flavor. 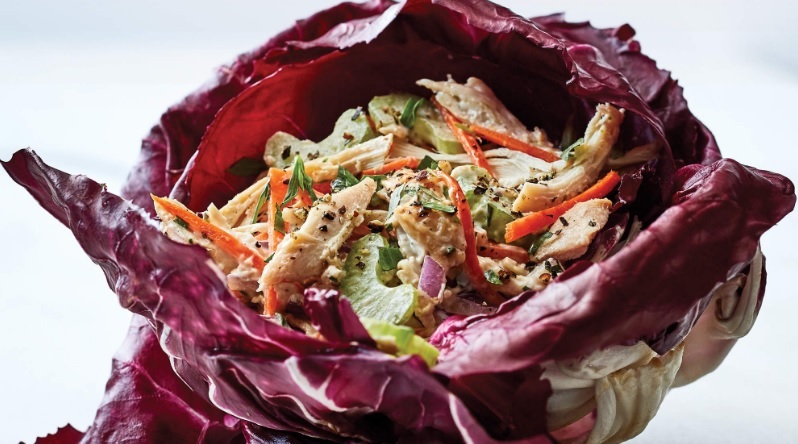 For this recipe, instead of spreading chicken salad between two slices of bread, opt for a healthier, more creative option: Chop, mince, and mix all ingredients together, then spoon the mixture evenly into radicchio leaves, which act like leaf cups. Although this is a super-simple meal, the most time-consuming part is cooking the rotisserie chicken, which can take a little over two hours to prep and bake. So, if you’re pressed for time or if you’re feeling really lazy, you can purchase a pre-made rotisserie chicken from your local supermarket. Once shredded, mix the chicken with your fresh produce, and no one will ever know (wink).